Time for my end of month visit to sponsor Eternal Maker. Lots to chose from as ever including metallic yarn dyed fabric, printed Essex linen and double gauze batik prints. 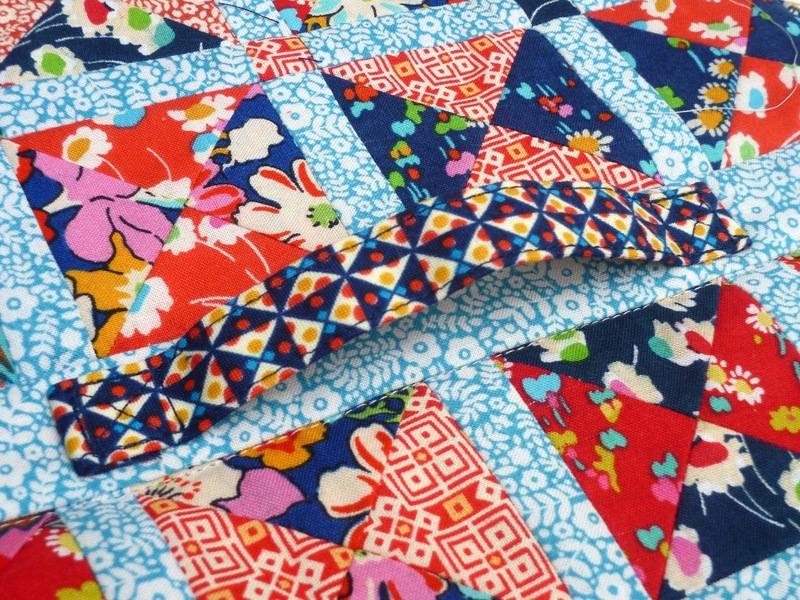 Elizabeth Hartman Pacific Fabrics- rabbits, droplets, anemones and more. Manchester Metallic in Bronze. New arrival. Manchester is one of Robert Kaufman's yarn dyed fabrics and also has a slight texture and a soft drapey handle. This colour way is still to be listed, in the meanwhile, email to order. Other examples (non- metallic) here and here. Lovely for dressmaking, and my first thought for the Deer and Doe dress below. Two Stitches Iris Tee. Pattern for jersey fabrics, age range 6mths- 12 yrs. Print and PDF options. Teal Dot Floral from Maribel, Annabel Wrigley for Windham Fabrics. Love love love this range and this is my favourite print from it. Euclid by Carolyn Friedlander, printed on Essex linen. 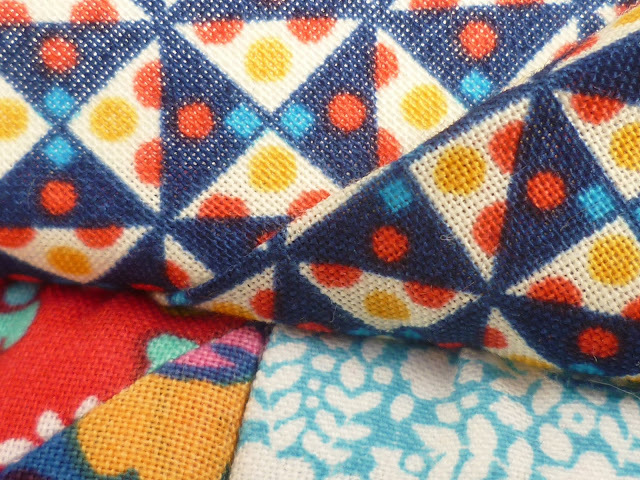 Beautiful stable linen/cotton blend, great for heavier quilts, bags, cushions and clothing. Double gauze batiks from Moda, soft and floaty, 110cm wide. Sashiko, Fans, Gulls, Could be an option for a lightweight Deer and Doe Aubepine dress. Metallic Zips, metallic fabric tape, teeth and tab. Three colours and two lengths to choose from. Mini Pearl Bracelets in Yellow. 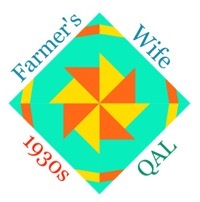 Lizzie House for Andover, sunny coloured quilting cotton. 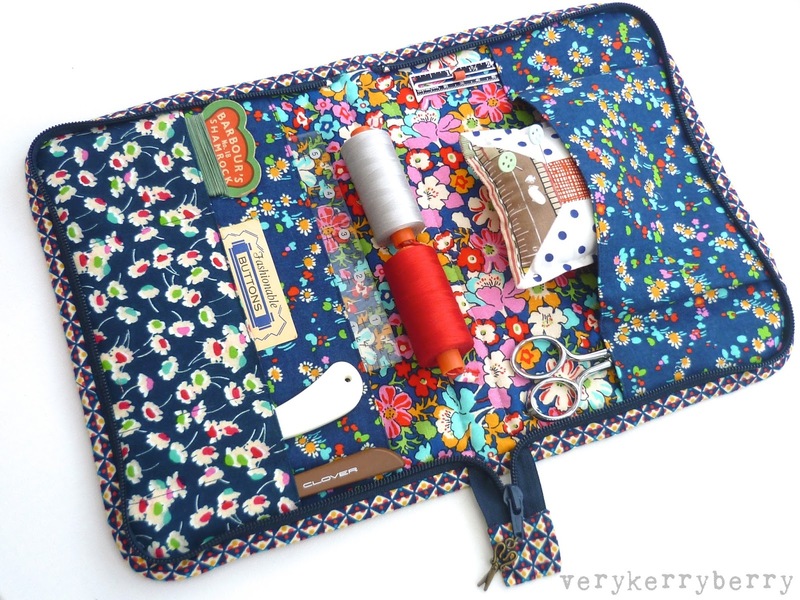 This tutorial to make a Portfolio Sewing Case for on-the-go sewing supplies was first written for Liberty Craft blog. Liberty had just released their Lifestyle quilting fabrics and I was interviewed by Michelle, their social media guru and I wrote this organiser pattern for the same feature. 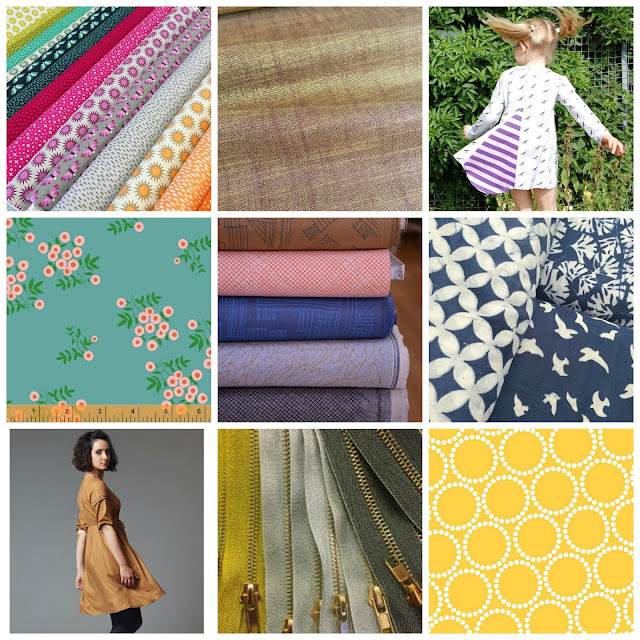 Liberty Lifestyle fabrics are no more and Liberty recently overhauled their website, changed their web address and focus with the apparent loss of all the Craft blog tutorials so on request I've posted the same details here for any who with to make it. It's quite an involved make but all the pieces are rotary cut- no pattern pieces, and it is a truly useful zippy holder for all your sewing paraphernalia. From Dorothy, cut 1 rectangle 10 x 11” for large flat lining pocket and another rectangle 9 x 11” for pleated bellows pocket. i. 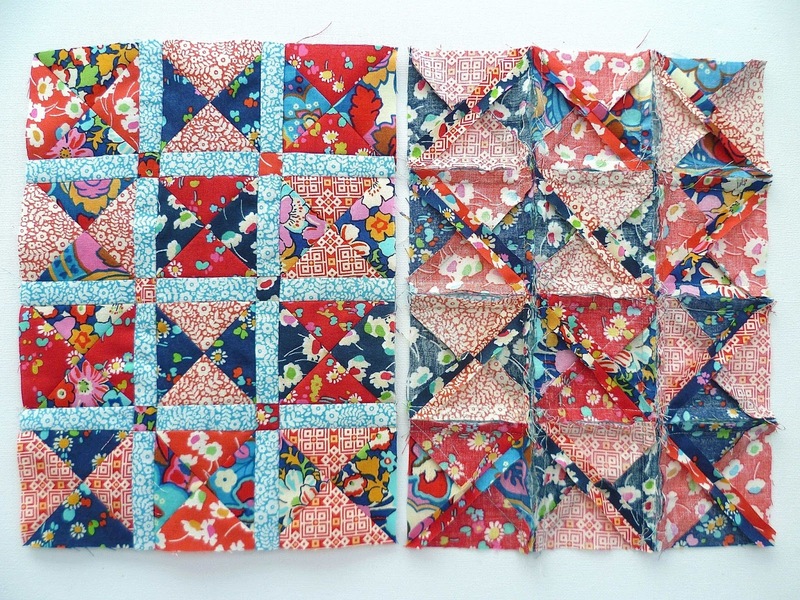 To make the hourglass blocks, pair the red and blue larger squares and place RS together. On WS of each top square, draw a diagonal line in pencil. Stitch 1/4”either side of this line using a small stitch (see a). Press flat, rotary cut across opposite diagonal (see b), then cut the pencilled diagonal (see c). Press triangles open pressing the seams towards the darker triangle each time. 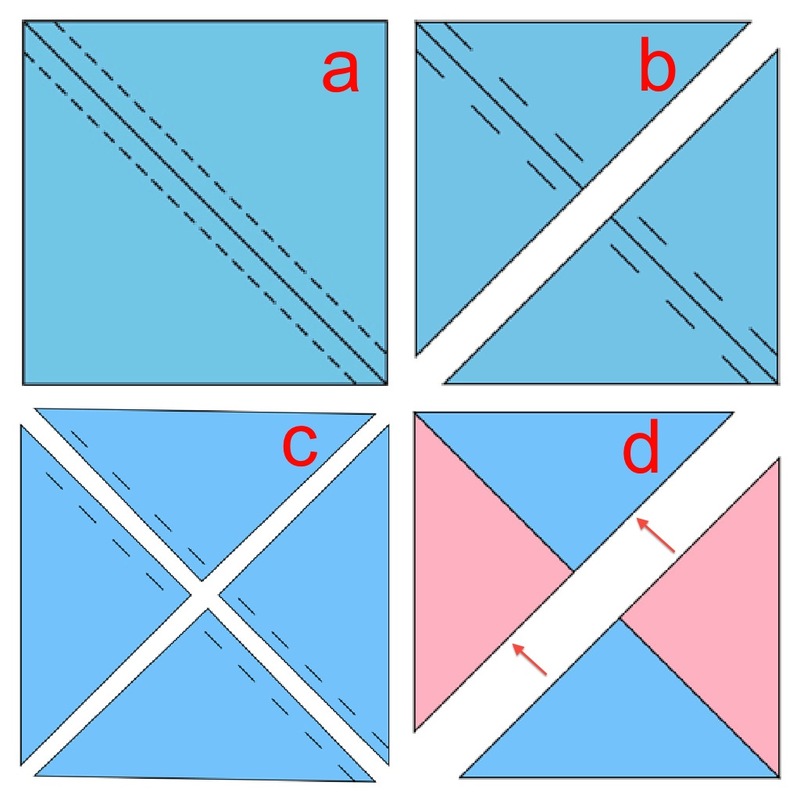 Pair triangles together (see d), the seams should nest together at the centre seam point. Stitch the diagonal seam, being careful not to pull the fabric as the bias will easily stretch. Press this seam open. 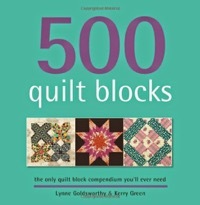 You will need to make 24 hourglass blocks. ii. Trim the blocks to 2 ½” square taking care to line up the diagonal with the ruler markings as you trim. iii. 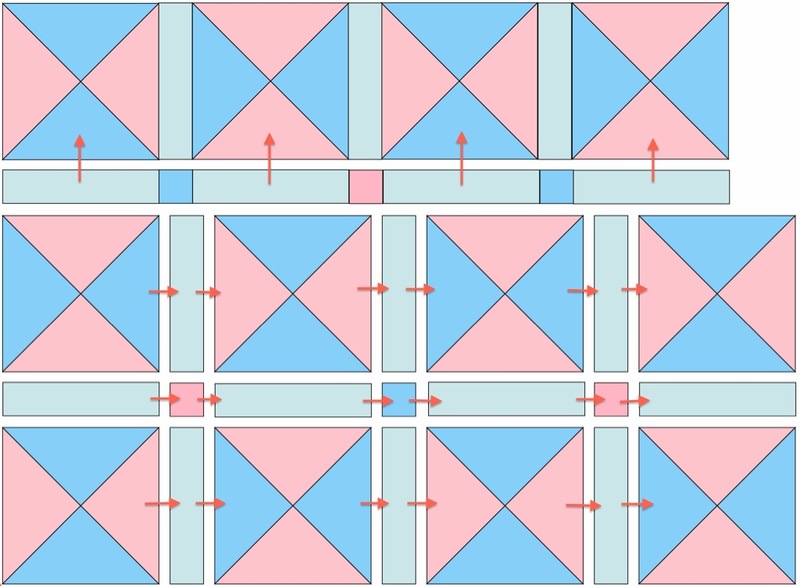 Arrange blocks into 2 panels each having 3x4 blocks. You can experiment with the layout by placing the blocks in different colour arrangements. Place narrow sashing strips and small red and blue squares between the blocks. 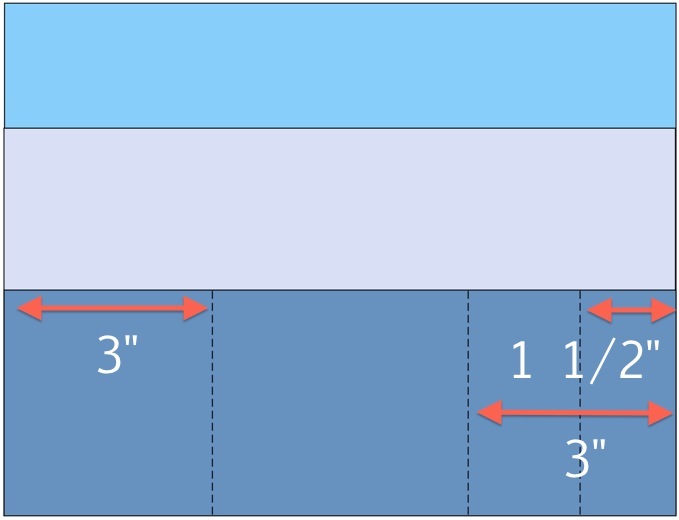 Sew blocks and sashing strips together in rows (see diagram below). Press seams towards the sashing. Sew sashing and small squares together in rows ( see pic). Press seams away from square. Sew the rows together as in the picture. Press these seams towards sashing. iv. Add light blue strip 1 1/2 x 10” between the two outer case panels. Press seams towards the strip. v. Press WS of outer case well to flatten seams.vi. Apply fusible fleece to WS following manufacturers instructions. Allow to cool and set to one side. i. Apply woven interfacing to the lining to WS of the fabric following manufacturers instructions. Allow to cool. 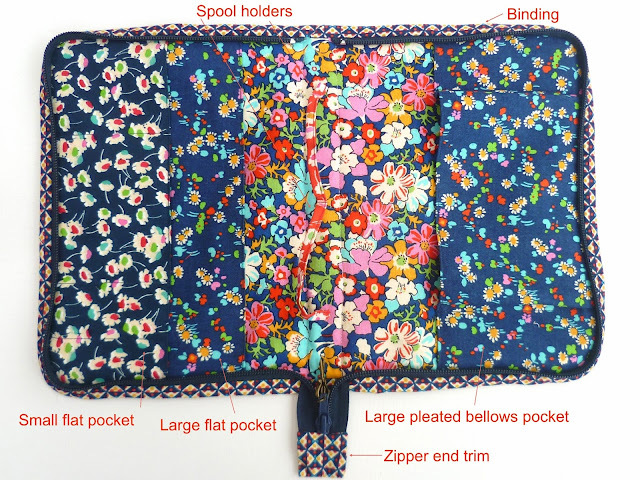 Fold each pocket fabric in half lengthways to make 3 pockets- a large flat pocket measuring 5 1/2 x 10”, a small flat pocket measuring 3 1/2 x 10” and a pleated bellows pocket measuring 4 1/2 x 11”. 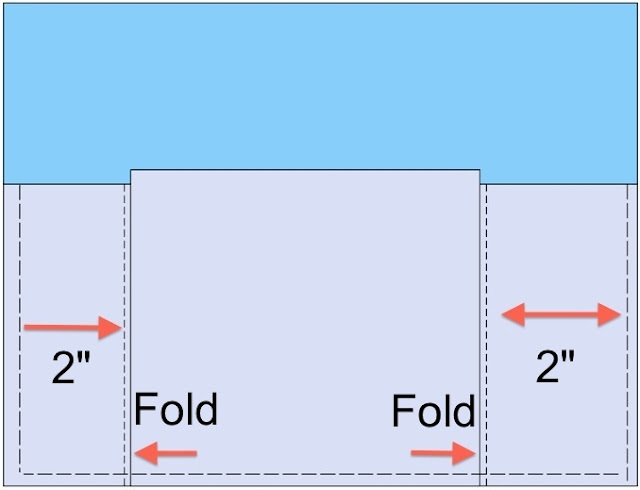 Open out folds and press interfacing pieces to half of each pocket on the WS of fabric lining up with the fold line. Allow to cool. ii. On all 3 pockets, topstitch along the folded edge. iii. Place large flat pocket over the interfaced lining. Pin to secure. The raw edges will be far left; the folded pocket edge will be left of centre. Baste the edges to the lining within the 1/4” seam allowance. iv. Place small flat pocket over the large flat pocket, aligning the long raw edges to the far left side. Pin to secure. Use a chalk pencil or disappearing marker to draw three lines that will form pocket channels. Follow the measurements in the picture. Stitch on the lines through all layers with coordinating thread securing each end of the stitching line with forward and reverse stitching. v. Place the pleated bellows pocket over the far right end of the lining. Baste the two side edges within the 1/4” seam allowance. Use a chalk pencil or disappearing marker to draw two lines that will form pocket channels, each is 2” from the outer edges. Stitch through all layers with coordinating thread securing each end of the stitching line with forward and reverse stitching. vi. 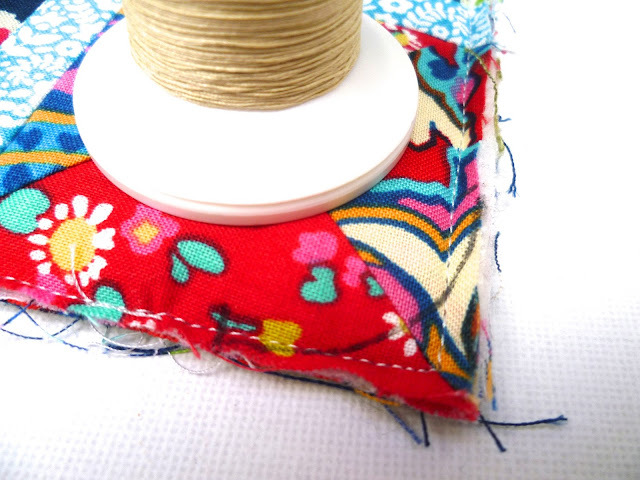 Make 1/4" folds in the excess pocket fabric at the stitching channels evenly on each side. Baste the lower edge of the pocket within the 1/4” seam allowance to hold pleats in place. i. Press the raw edges in 1/4" all around the red strip 1 x 8 1/2". Bring the 2 long edges together and press the fold. 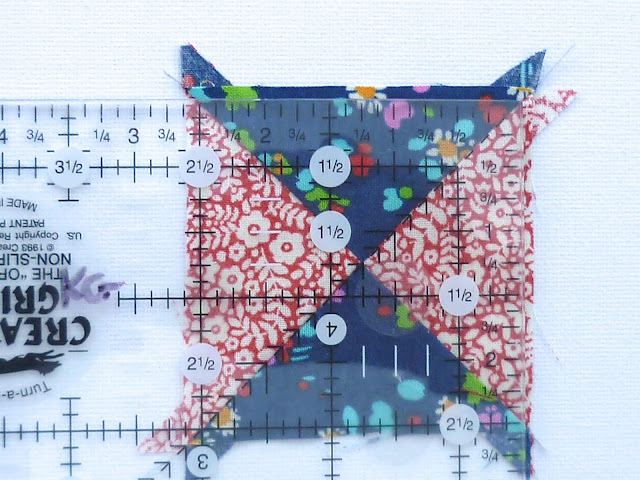 Stitch along the fold to make a long thin strip. v. On the fabric strip, sew the male part of a press stuff to the underside of the fabric strip so the press stud meets with its other half on the lining. i. 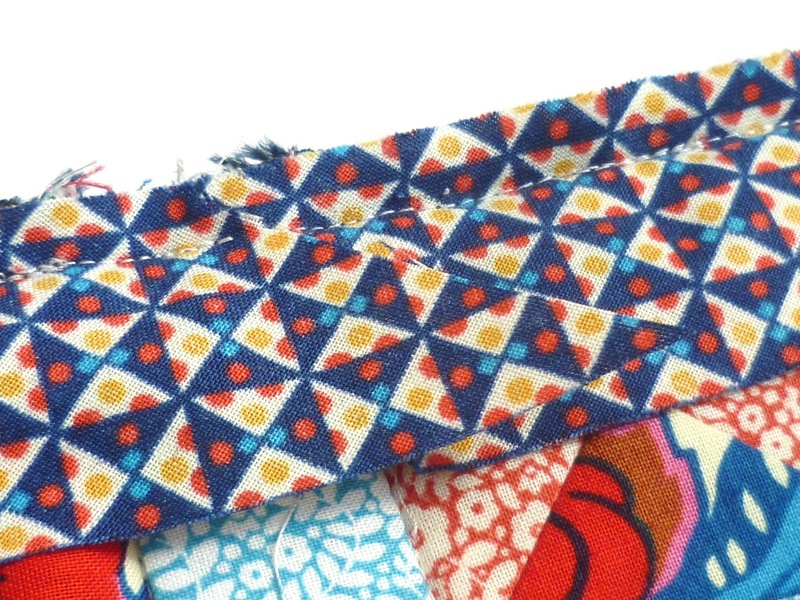 Take handle fabric strip 2 1/2 x 6 1/2" and interfacing. Apply interfacing. 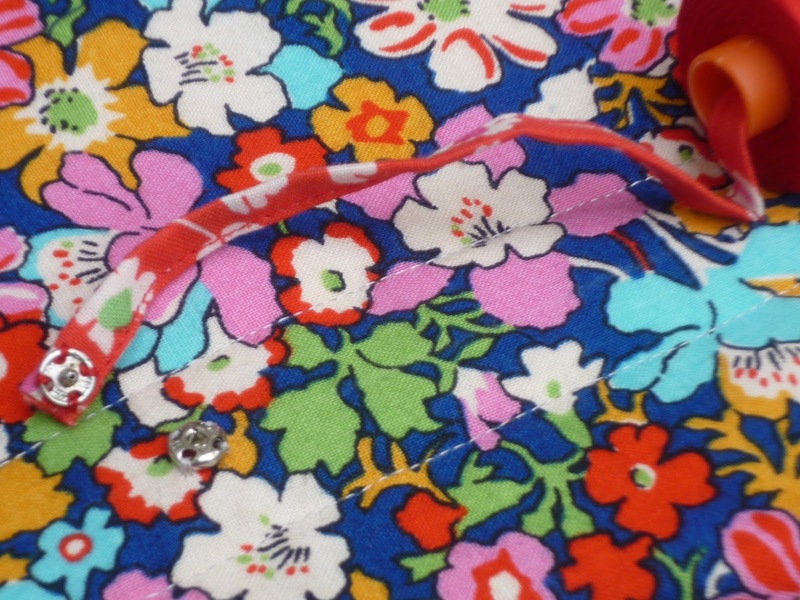 It is shorter than the fabric strip so there should be 1/2” at either end of the strip with no interfacing. Fold the strip in half lengthways, press and open out. Fold long edges into the fold, press and pin. 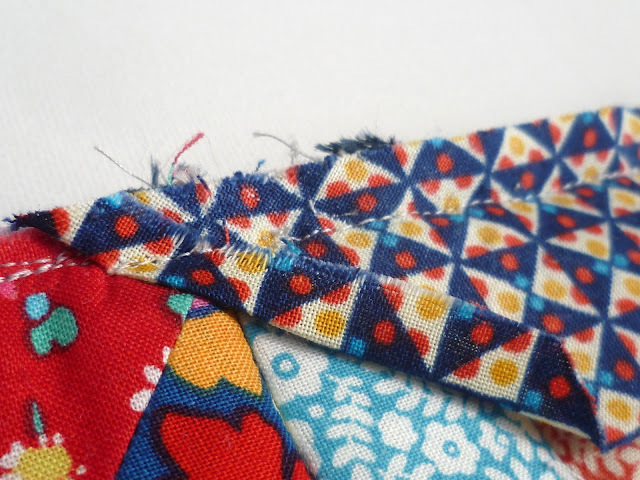 Stitch through these layers and the opposite folded edge. Press short raw edges in 1/2" at both ends of the handle. On the RS of the outer case, mark, place the handle on the centre light blue strip and pin the two folded ends placing the handle centrally (see photo below). Stitch a small 1/2” square and X to secure at each end of the handle, as in the photo. ii. Place lining and outer case WS together. Pin around edges and machine baste within the 1/4” seam allowance. iv. Mark 1” points from each corner on the outer case. Use a small glass or large spool to round the corners. The curve should run to the very edge of the fabric at the 1” points. Trim the corners following this line and baste the edges together as before within the seam allowance. i. 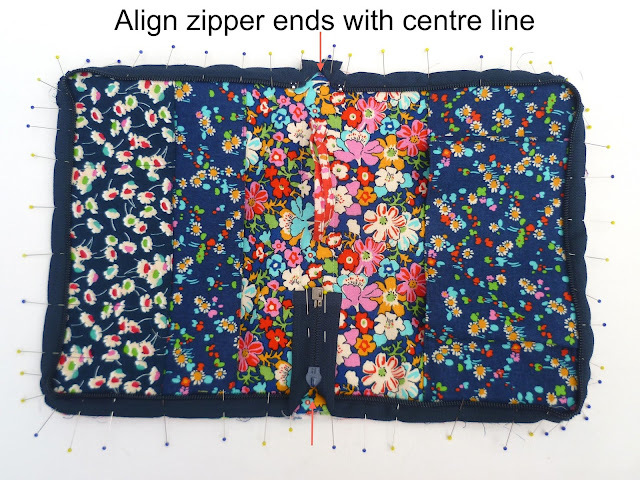 Open the zipper and starting on the lining side, fold the zipper ends diagonally and align with the centre line of the lining. 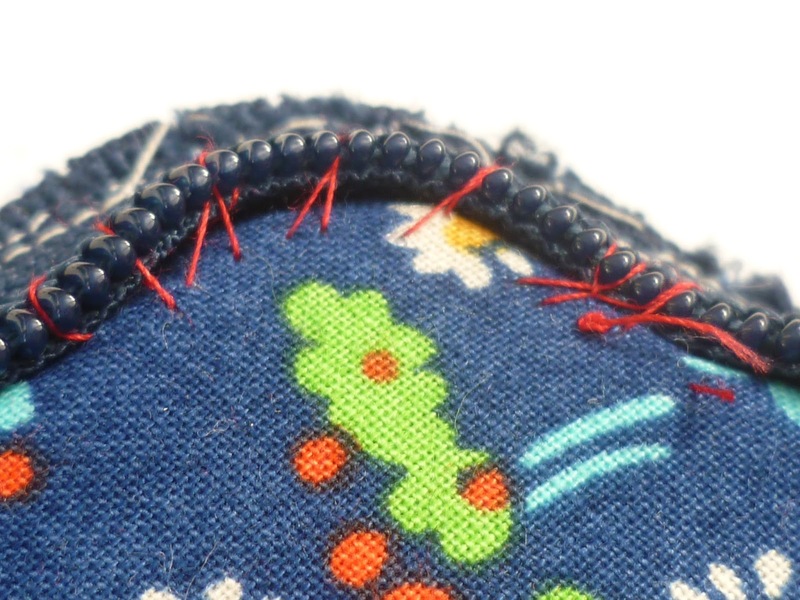 The zipper teeth should start just after the two stitching lines (see photo below for reference). Around the curves, you will need to cut 1/8” deep cuts in to the edge of the zipper tape 1/8- 1/4" apart. 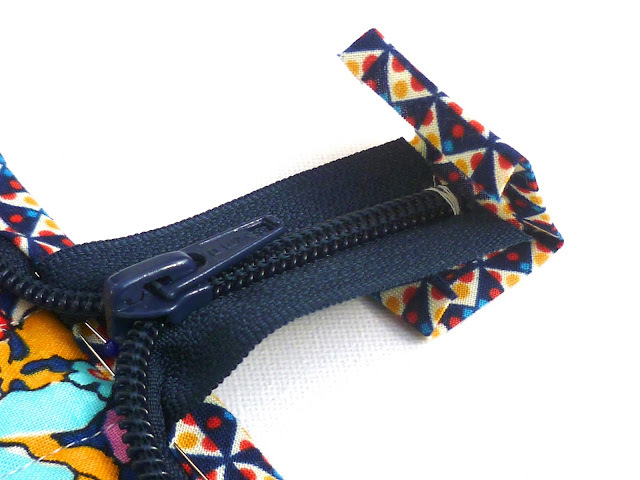 This allows the zipper to lie flat around corners. 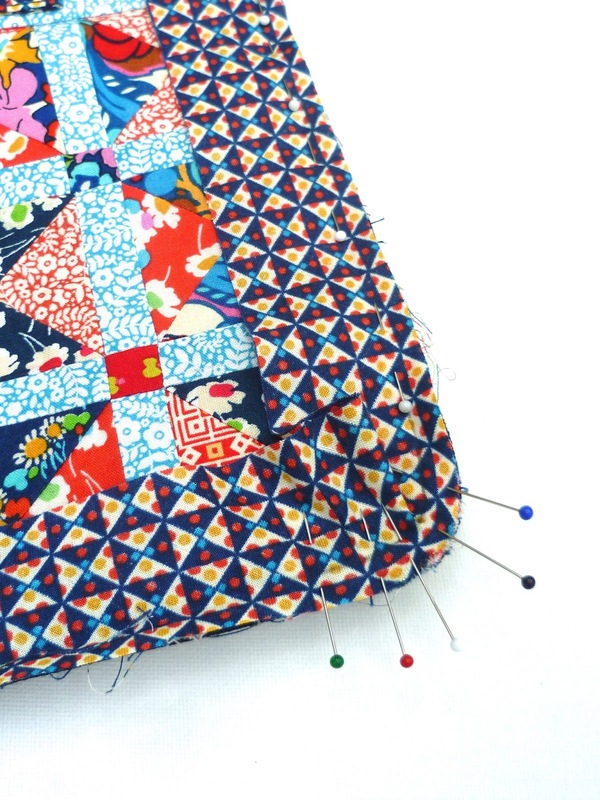 Use lots of pins and pin the zipper teeth down at the corners. The end of the zip aligns with the centre front line on the opposite side and the end is folded inwards and pinned down (see photo below). ii. Using a zipper foot, starting on the right side at the start of the zipper, stitch slowly within the 1/4” seam allowance, removing pins as you sew. The corners are tricky. Take your time and make sure the teeth are flat and pinned down as you sew around the curved edge. The stitching will not be visible in the finished organiser so you can start and stop and redo areas if needed. 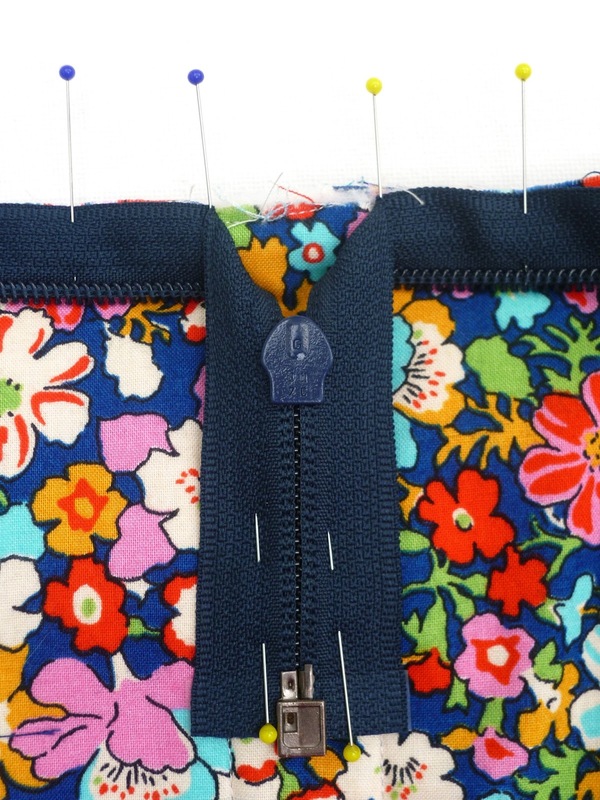 At the end of stitching both sides, check the zip closes properly and trim the overhanging ends at the top of the zip. i. Hand sew the bottom of the zipper with an overstitch, just before the metal end. Trim off the metal end. Take the zipper end trim fabric rectangle, press 1/4” all around the edge and bring the short edges together and press the fold. ii. Place zipper end within the folded trim and hand sew the edges. i. Place the binding strip RS down on the ironing board, press 1/4” fold all the way along the top edge. Trim the far left end diagonally and fold the edge in by 1/4" and press. ii. 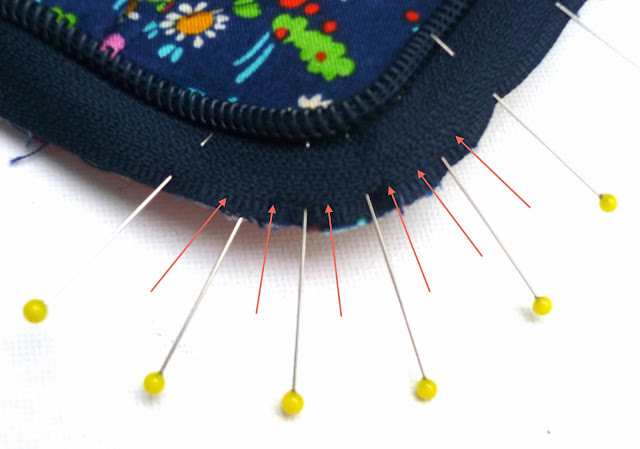 On the lining side, baste the zipper teeth to lie flat at each corner. iii. Starting at the centre front line on the outside of the organiser, pin the edge of the binding aligning the edge with that of the case. Pin as far as the beginning of the first corner. Take a pencil and on the WS of the binding, make a pencil mark along the fold line for a couple of inches. Pin the binding around the corner. Use lots of pins! Slowly stitch a 1/4" seam from the start to this point, using the pencil line to continue the 1/4” seam around the corner. Secure the beginning and end of the stitching. Pin along the straight edge and to the next corner and then repeat as above for each corner. iv. At the end of the binding, let the binding ends overlap for an inch and trim the binding end diagonally. v. Join the folded end at the start of the binding to the fabric underneath with small hand stitches. vi. On the organiser outside, lightly press the binding away from the seam line. Fold the edge in so the fold line just covers the zipper seam stitches. Hand sew the binding down on the inside of the organiser. vii. Add a zipper charm if using. Your sewing portfolio organiser is complete! It is now ready for all your notions and tools! 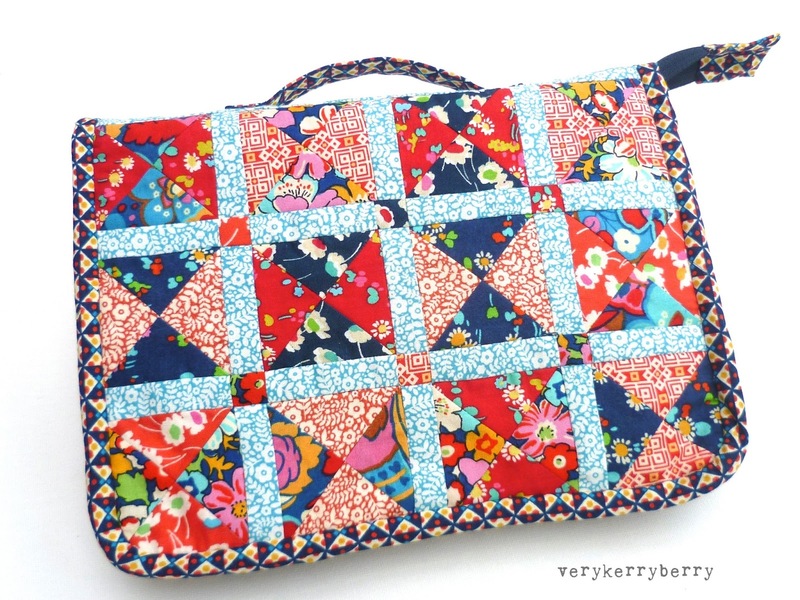 If you'd like to see the same case but with different fabrics, Lucy of Charm About You is a keen hand sewer and English Paper piecer and she made a wonderful version with a fabulous selection of Denyse Schmidt prints for the inner- see it here. 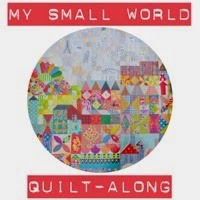 And if you make one, get in touch and show me!